How do you ‘really’ implement a successful CMDB/CMS? Organisations have been desperate for one database view of their assets and its relationships for years and therefore the concept of the CMDB/CMS is one they strive for but is it realistic? Some spend millions on this pursuit, with mixed results and others feel it is too difficult, so they tend to focus on the more traditional ITIL aligned processes of support. In addition, some ITIL professionals claim it can’t be done, whereas others claim they have achieved it – where do you stand on this? I am of the belief and experience that it most certainly can be done and I would be pleased to share my practical insights. 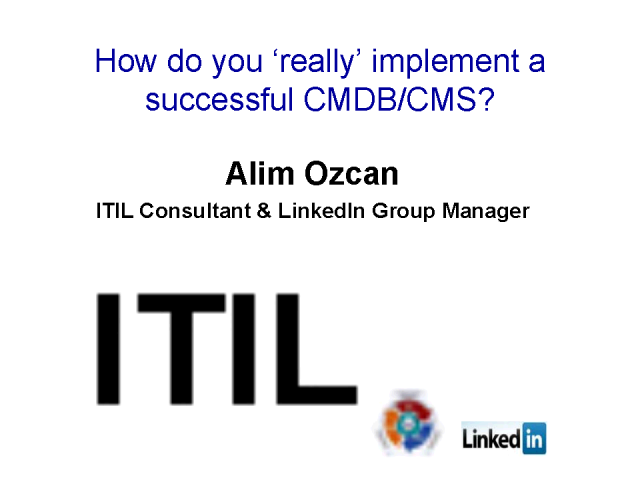 Title: How do you ‘really’ implement a successful CMDB/CMS?